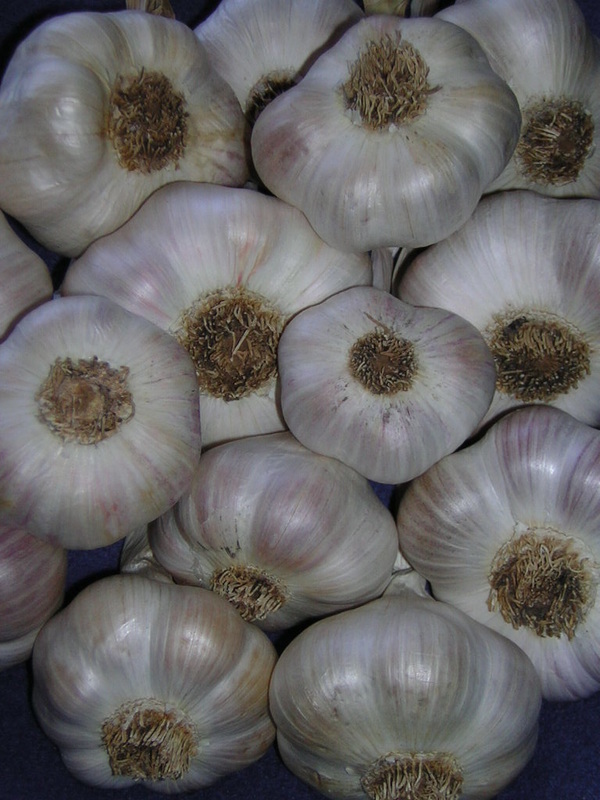 Despite its Italian sounding name this large, clean, wonderfully mild garlic originated in the Republic of Georgia, a southern former USSR country, as have so very many cultivars-these people know and love garlic. Simoneti is one of my own personal favorites for raw eating. The flavor is definitely garlicky, but with minimal aftertaste and heat. This gentle giant is great for those who like it mild but with full flavor. If strong garlic upsets your stomach, try this one instead. Simoneti has thick, very white bulb wrappers that are easy to peel and it stores well. Even the inner cloves are of good size. It is another grower's delight as it has many large plantable cloves (12 to 15 or more) and you can build up your garden with it in only a season or two. Simoneti has a very thick neck and is very large leafed and has a rather roundish shape. If you like it as much as I do, you will want to get a few extra for planting this fall. As with other large artichoke garlics it harvests in mid-season (one of the latest artichokes) and takes a little longer than average to cure when it grows to large size.